Whether working with a trellis, fence, or mailbox, flowering climbing vines add beauty to the project. There are countless varieties of vines, but choosing the perfect flowering one may require a bit of research. A couple of things to consider are the best type for your growing zone and available sunlight to get optimal results. Vines are woody plants that grow on thin, trailing stems. Due to the fragile nature of the stems, most vines perform better when supported by another structure such as a tree, wall, or fence. Though a detractor if you wanted to plant the vine on its own, the composition of the stems make it easy to train a vine into a shape or up a post. Clematis is one of the more well known flowering climbers. Available in several varieties, clematis should be grown in well drained moist soil. Plant where the vine will not receive full northern or western sun because the intensity may cause the plant to overheat and wither. It is advisable to plant where it will receive eastern sun most of the day. Since a fully mature clematis plant can grow up to eight feet tall, pruning may be required for mailbox plantings. Popular varieties include: Star of India and Gypsy Queen. Honeysuckle vine is most often grown for its sweet fragrance. The vine grows in full or partial shade as long as the soil is well drained. Honeysuckle is a vigorous grower and should not be planted where trees would be required for support because it may smother a growing tree. Instead, plant on a trellis for the best outcome. Varieties that work well include: Trumpet, Dropmore, and Goldflame. Flowers will range in color from white to deep salmon and are especially popular with pollinating bees. Be careful about selecting a honeysuckle variety. Many are considered invasive. Wisteria is another vine grown for its clusters of bluish-purple flowers that resemble grapes. A fairly slow grower, many gardeners have learned the value of patience when cultivating wisteria. Often it is two to three years before the first flowers blossom so wisteria is not a garden quick fix. Mature wisteria vines can be over 50 feet tall, which makes arbors or trees the best choice for support. If using wisteria, opt to train the vines along a pergola to ultimately have a roof cover of vines. For arbors, significant pruning is required each season to maintain flower production. Morning glories are an annual vine from the Convolvulus family that grow in zones three through ten. Named morning glory because the flower blooms in the morning and dies by the end of the day, this flowering climber needs full sun to bloom vigorously. The trumpet shaped flowers are available in a variety of colors with the most popular one being blue. For best results, plant seeds early in the season and keep the soil watered regularly. Jasmine is a fragrant plant cultivated as both ground cover and vines. 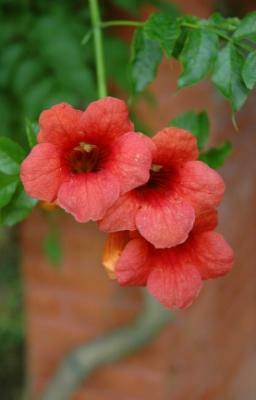 The flowering vine varieties include: Common white, Japanese, Star, and Yellow star. Originally propagated in tropical South America, Jasmine is reserved for zones seven and farther south. The small blossoms range from white to bright yellow and typically bloom from mid-spring through late summer. Plant in particularly moist soil with either an arbor or trellis for support. Regardless of which flowering climbing vines you chose, make sure to consider its mature size in relation to your project. This is especially important when planting for growth up a mailbox post since an overgrown tangle of vines will make it difficult for the mail carrier to deliver your mail and packages.